There's a simple reason why the distilled spirits out of the Mendocino County-based Germain-Robin garner such impressive reviews from professionals: because they are ridiculously good. The other day I reviewed Germain-Robin's Single Barrel Colombard, an ultra-smooth, velvety, delicious, and delicate brandy. Well, today I am looking at another brandy in their lineup, their Coast Road Reserve. Distilled by hand on our antique cognac still, aged in Limousin oak, blended from an appealing mix of richly fruited brandies and deeper, oakier, and more mature distillated. 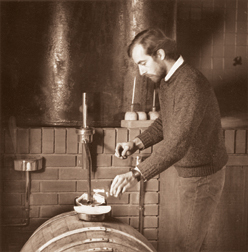 A portion of the blend dates back to our earliest distillations. Plenty of pinot noir brandy means focused complex flavor and a finish that lasts for about 50 miles. Coast Road Reserve pours a dark, golden amber which could easily be mistaken for an older bourbon. It smells like rich brandy, with hints of apricot and dark florals. When you taste it, you are greeted with luscious deep fruits and a sweet oakiness. It finished quite smoothly with a lingering gentle, fruity sweetness. It really has some remarkable depth and complexity, without being too in-your-face. This blows stuff like Courvoisier VSOP out of the water. I could drink Coast Road Reserve all day long. Except for well, you know, having to take care of my family, keep a job, and drive a car. Comparing this to the Single Barrel Colombard, the Coast Road Reserve is more aggressive and fruit-forward, whereas the Single Barrel is more about subtlety, delicacy, and softness. Both are wonderful and both have a time and a place where they are well suited. Drink This: if you want a rich, complex, yet not cloyingly sweet brandy. Don't Drink This: if you are a fool. This is really great stuff and well worth buying for anyone who enjoys spirits. Like the Single Barrel Colombard, this could easily turn many people onto brandy. "Don't Drink This: if you are a fool." LOL, Now, THAT'S a review! I'm no fool - I'm looking for some as we speak.